"Sampath Speaking" - the thoughts of an Insurer from Thiruvallikkeni: Age cannot wither ... why politicians are old ! - toughest diplomat strikes again !!! Age cannot wither ... why politicians are old ! - toughest diplomat strikes again !!! Age cannot wither her, nor custom stale her infinite variety – wrote William Shakespeare.. .. .. yet, age is a major factor ! In India, most often, politicians are seasoned and old !! .. .. In 2014 Indian Parliament, just 53% of members were under the age of 55, making the 16th Lok Sabha oldest ever. India’s parliament has been growing steadily older over time; the first two Lok Sabhas had the highest proportion of young MPs under the age of 40. AIADMK leader S M Seenivel, who was elected to the Tamil Nadu Assembly from Tirupparankundram constituency, died in Madurai on Wednesday, hours before the first session of the 15th. Mr Seenivel 65, reportedly succumbed to stroke. The recent elections had their own share of old candidates in the fray – most notable being Mr VS Achuthanandan and Mr M Karunanidhi. In Assam, Tarun Gogoi, is 81. This was Achuthanandan’s eighth Assembly election. He first contested 49 years ago, in 1967, from Ambalapuzha. Karunanidhi fought his 13th Assembly having begun at Kulithalai in 1957. Often, we find, politicians at quite an old age are appointed as Governors and ambassadors ! When Barack Obama first walked through the White House front door back in January 2009, he was aged 47, and was the fifth-youngest president in history. Theodore Roosevelt was the youngest, at 42 years and 322 days. This time, such a thing is unlikely to happen. Bernie Sanders will be 75 on inauguration day on 20 January 2017, almost six years older than the oldest president on inauguration, Ronald Reagan. Donald Trump celebrates his 70th birthday on 14 June, so he too would be the oldest president in history. Hillary Clinton, meanwhile, turns 69 some two weeks before the election, and would become the second-oldest president on inauguration. She would replace William Henry Harrison, who became president in 1841 ! In Oct 2014, the Parliament Hill in Ottawa rocked. At the Canadian National War Memorial, Michael Zehaf-Bibeau fatally shot Corporal Nathan Cirillo, a Canadian soldier on ceremonial sentry duty. He then entered the nearby Centre Block parliament building, where members of the Parliament of Canada were attending caucuses. After wrestling with a constable at the entrance, Zehaf-Bibeau ran inside and had a shootout with parliament security personnel. He was shot 31 times by six officers and died at the scene. The attacker was identified as a 32-year-old Canadian habitual offender and drug addict from Montreal. Classified by the RCMP as a terrorist act under the Criminal Code, it was the most serious security breach at Parliament Hill since the 1966 parliament bombing. It took place two days after a man used his car to run over two Canadian soldiers in Saint-Jean-sur-Richelieu, Quebec, killing one. The two incidents, which attracted international attention, raised concerns about the effectiveness of police actions to prevent terrorist attacks, the prevention of radicalization and the security measures in place at federal and provincial legislatures. Zehaf-Bibeau entered the Centre Block through the main entrance under the Peace Tower, where Samearn Son was one of two constables on duty. Son saw the rifle in Zehaf-Bibeau's hand, immediately grabbed it, but was shot in the foot and had to let go of the attacker. Finally, Zehaf-Bibeau reached an alcove by the entrance to the Library of Parliament, and hid out of sight of RCMP officers. 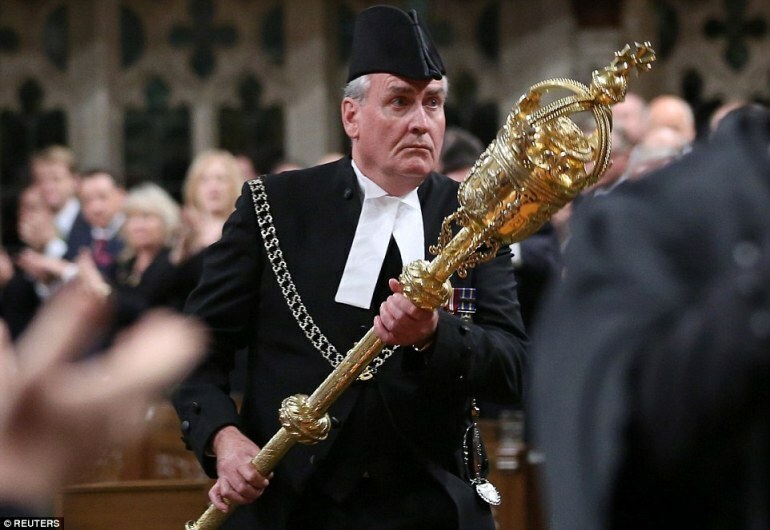 Kevin Vickers, a distinguished policeman, commander and administrator with the RCMP before he joined the staff of the House of Commons in 2005, obtained a 9mm handgun from a lock-box and entered the hall. The man was hailed as hero as the Ottawa terrorist was shot dead by the group of police cops. Mr Vickers, who has a strong Irish-Canadian background, was later appointed ambassador to Dublin. The man hailed as the world's toughest diplomat strikes again! Canadian ambassador who was hailed a hero after shooting dead Ottawa terrorist now takes on a protester at an Easter Rising ceremony in Ireland. Reports suggest that Kevin Vickers grabbed the demonstrator, tackled him and held him and the man was chanting 'insult' at ceremony. He detained the protester before police arrived at the scene, grappled him to the ground and arrested the man. Vickers became a household name for shooting dead terrorist Michael Zehaf-Bibeau in 2014 in Canadian parliament. Mr Vickers, 59, was attending the State ceremony as Canada's ambassador to Ireland when a man in his 40s attempted to disrupt it. Dressed in a suit and raincoat, he grabbed the protester by his black leather jacket before police moved in, forced the suspect to the ground and arrested him. The man in his 40 reportedly was heard shouting 'this is an insult' at the start of the invite-only event. Ireland's Foreign Affairs Minister Charlie Flanagan laid a wreath in memory of up to 125 British soldiers killed during the 1916 rebellion against British rule. The ceremony commemorating their deaths is one of a number organised to mark the 100th anniversary of the insurrection, which ultimately led to the creation of the Republic of Ireland and Northern Ireland.